Last month the Bureau of Economic Analysis released data on GDP, personal income and private consumption that give us a first look at how the economy is responding to the Trump presidency. So far, it looks like our 45th president has done a good job inspiring - and clearing the ground for - a resilient economy. This article takes a look at the major trends and explains why we have reasons to be cautiously optimistic (and why Congress better start working with Trump, instead of trying to sabotage his policy agenda). A follow-up article will place these new macroeconomic data in a Wyoming context. To begin with, it is now fair to say that the decline in growth we saw in early 2016 was a cyclical "breather". In 2015 we experienced a peak in the recovery from the Great Recession; fortunately, we did not go into a recession in 2016. Since it gained steam again toward the end of 2016, the economy has continued to grow through the first two quarters of this year. There is good news and bad news about this growth. The bad news is that it is not exactly impressive. In order to maintain the standard of living we have, we need to sustain an inflation-adjusted growth rate of two percent over time (see the dashed line in Figure 1). Since 2010 we have averaged 2.1 percent, which barely keeps us afloat as a country. 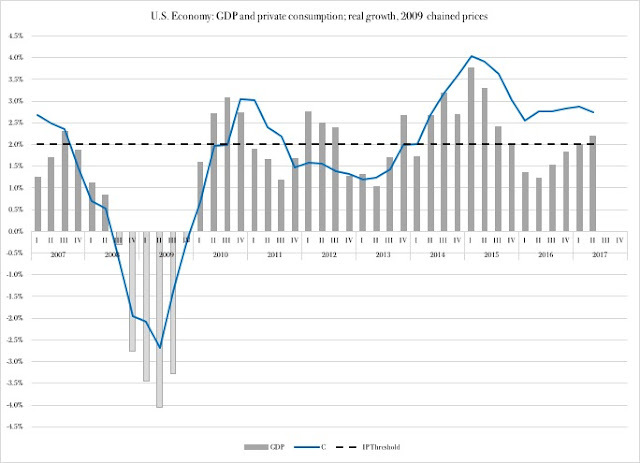 Private consumption has fared a little bit better with a 2.4-percent average since 2010. This begs the question why GDP growth is lower than the growth in private consumption: since consumption is responsible for a bit more than two thirds of GDP, should not its higher growth rate pull GDP higher? The answer is: net exports. Our negative balance of trade subtracts enough growth to drive a wedge in between private consumption and GDP. If we remove net exports from the picture, the remaining components of GDP - private consumption, business investments (or GFCF) and government spending - actually grew at 2.3 percent for the 2010-2017 period. This number, being healthier compared to the two-percent industrial poverty threshold, gives us a bit more assurance that our economy is at least not going backwards. We still have a low-growth problem, though. In the decades from World War II to the Millennium Recession we got used to 3+ percent growth per year. Those rates are attainable again if we want to. Investment spending fluctuates quite a bit, even when adjusted for inflation. This is natural for something that is in essence auxiliary spending, namely spending in support of production, which is the primary business activity. That said, its fluctuations are important indicators of where the economy is going and at what pace. Right now, things are looking good, better in fact than we had reasons to expect only six months ago. The key indicator of optimism is in the sequencing of these two variables (and please bear with me if this gets a bit technical - there is an important point at the end). Going back to 2000, the earliest year for which we can obtain year-over-year investment growth data at this level of detail, we see that businesses have changed equipment purchases before they have altered investments in structures. There is a good reason for this: equipment investments are more short-term in nature than structural investments; when businesses operate with the short term in mind, they consider primarily equipment purchases. Structural investments are made only when they are at capacity and can safely predict that new structures will pay for themselves. 1. Taxes. With the highest corporate income tax in the world, the United States is not exactly a haven for businesses. To operate profitably, they have to spend profusely on lobbying Congress, the President and even state legislatures and governors, for tax loopholes and exemptions, as well as corporate welfare. This is nowhere near ideal for businesses, and naturally they adopt a short-term view of their operations here in the United States. 2. Regulations. Much the same reasoning applies here as with taxes. When Congress has surrendered enormous regulatory powers to the executive branch, it becomes exceedingly costly for businesses to adapt, comply and lobby for exemptions. Again, an incentive to be short-term in business planning. 3. The federal deficit. As I recently explained in the first of a series of videos on the U.S. debt crisis, our perennial federal deficit has already built an unsustainable debt burden. We have a very short time frame within which to correct that, and if we don't, we are going to experience an austerity storm of European proportions. Astute business leaders know this; many of our multi-national corporations have had first-hand experience with austerity in their European markets (which have seen austerity episodes come and go since the 1980s). It is only natural for them to at least conceptualize what a runaway debt situation could do to the U.S. economy and to respond by keeping a somewhat more short-term outlook on stateside investments than they otherwise would. The jobs-and-investment migration to China should be seen in the context of these reasons for short-terming investment planning in the United States. With all that said, here is the point about resiliency in our economy. 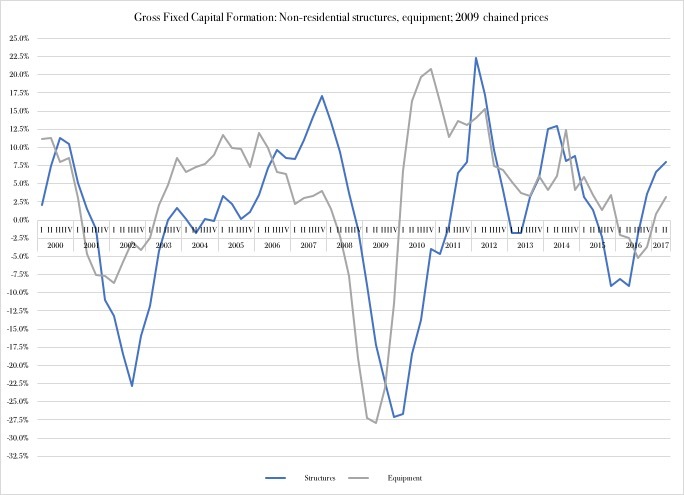 Take a look at what happens to the sequencing of investments toward the end of the period in Figure 2. About the end of 2014, when Obamacare really took effect and the prospect of regulatory reform was reduced to a punch line, structural investments suddenly dropped ahead of a decline in equipment purchases. This downturn continued through 2015 and bottomed out in 2016. In the second half of that year it slowly ticked up again, with the prospect of a Trump presidency. Again, the lead variable in this recovery is the structural-investment component, the one that is more long term in nature. This is a clear sign that American businesses take seriously what they stand to gain from a successful Trump presidency. To reinforce this impression, investments in equipment began rising about two quarters behind structural investments. In other words, businesses followed up on their plans for long-term expansion here in the United States. There is a fair amount of growth potential in a long-term oriented investment boom. With the success of Trump's fiscal policy agenda, including tax reform, we might find ourselves well above three percent growth by the time he is up for re-election. We better hope he succeeds. That growth is the only thing that stands between us and an austerity experience of European proportions. If Congress decides to sabotage Trump's tax reform, and the rest of his fiscal policy agenda, they are going to pave the way for a historic decimation of the U.S. economy. Every member of Congress who opposes President Trump on fiscal policy is going to share the responsibility for that decimation. In a coming video I will expand in greater detail on what the threat of an austerity storm really means. Before that, though, Monday's blog article will discuss what the cautiously good news about the U.S. economy means for Wyoming.